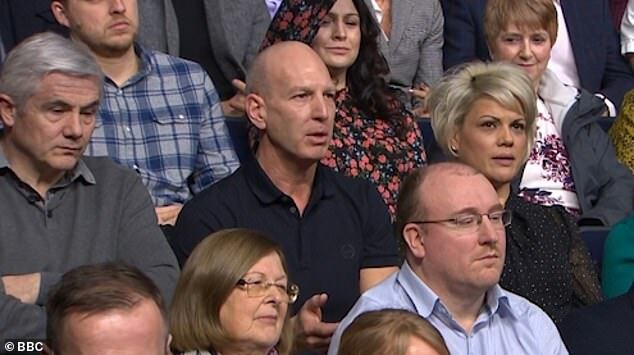 Britain will work around any disruption caused by a no deal Brexit, members of the public on the Question Time audience insisted last night. One man got a huge round of applause for telling a panel including Remain campaign Gina Miller they were talking 'absolute rubbish' about no deal. Politicians, who included Tory Helen Whately and Labour's Richard Burgon, were accused of 'limping before you get kicked'. The tirade came amid mounting preparations for no deal Brexit because of the deadlock in Parliament over the negotiated divorce plan. Major supermarkets warned this week the shelves could be empty of fresh produce within days of Britain crashing out on March 29 if no deal can be agreed. But the audience cheered last night when one man said: 'I think it's absolute rubbish really. You're all limping before you get kicked in a lot of ways. 'There is a lot of talk about we won't get lettuces into the country, tomatoes and other produce. 'There is going to be disruption, there's no doubt about that, but in this country we are resilient. 'We are going to find a way around these problems. It's going to take a little bit of time, there is going to be a bit of disruption. She accused the Government of having created the prospect of shortages by failing to prepare properly. Leading retailers warned on Monday a no-deal Brexit would cause 'significant disruption' to food supplies because Britain is dependent on the EU for fresh produce. A letter to MPs, signed by bosses from firms including Sainsbury's, Asda, Marks & Spencer, Waitrose, The Co-op, Lidl, McDonald's and KFC, warned about shortages caused by delays at the border and price rises as a result of tariffs. The firms - used by millions of Britons every day - said the timing of Brexit at the end of March made the situation worse because of when UK crops are harvested. The findings are based on the Government's own analysis, which says that up to 87 per cent of cross-Channel freight trade could be stopped, in disruption lasting up to six months. 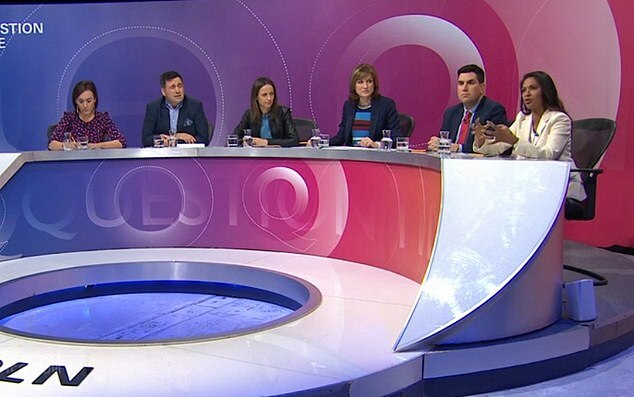 The panel - which featured Remain campaigner Gina Miller (right) and politicians including Tory Helen Whately (third left) and Labour's Richard Burgon (second right) - were accused of 'limping before you get kicked'. The supermarket and restaurant chain bosses said: 'We are extremely concerned that our customers will be among the first to experience the realities of a no-deal Brexit. 'We anticipate significant risks to maintaining the choice, quality and durability of food that our customers have come to expect in our stores, and there will be inevitable pressure on food prices from higher transport costs, currency devaluation and tariffs. The retailers added: 'As prudent businesses we are stockpiling where possible, but all frozen and chilled storage is already being used and there is very little general warehousing space available in the UK.